NAIROBI, Kenya (AP) — Dawn was just beginning to break when Joseph Kamonjo Kariuki woke to find his donkeys missing. The villager searched the bush frantically for the animals he depends on to deliver water for a living, but they were nowhere to be found. It was the village’s children who led Kariuki to the ghastly remains: three bloody, severed donkey heads lying on the ground. “I was in shock,” said Kariuki, 37, who is known in his Kenyan village of Naivasha as “Jose wa Mapunda” — “Joseph of the Donkeys” in Swahili. Kariuki believes his donkeys were the latest victims of a black market for donkey skins, the key ingredient in a Chinese health fad that’s threatening the beasts of burden many Africans rely on for farm work and transporting heavy loads. From Kenya to Burkina Faso, Egypt to Nigeria, animal rights groups say, agents are seeking to feed China’s insatiable appetite for a gelatin they call ejiao (pronounced “uh-jee-ow”), made from stewed donkey skins that purports to provide health benefits. Shrinking donkey herds in China have driven ejiao producers to seek out donkey skins from Africa, Australia and South America, threatening the world’s donkey population and driving violent crime and protests across Africa, the activists say. “At this rate we will tell our children that donkeys once existed,” he said. In Kenya, the donkey population has fallen in the past nine years by a third — from 1.8 million to 1.2 million. Kenya’s three licensed slaughterhouses butcher 1,000 donkeys a day to supply skins to China, said Calvin Onyango, program development manager of the Donkey Sanctuary Kenya. Onyango said that the rate at which donkeys were being slaughtered meant that there could be none left in five years. On the road into Dong’e, billboard after billboard proclaims the purported curative powers of the gelatin. “Ejiao, eat for a long life, lose weight, and get more energy,” reads a slogan printed on the side of a hotel dedicated to gelatin tourism. Farmers raise hundreds of donkeys in metal-roofed dirt paddocks surrounding the town. Most donkeys at three farms The Associated Press visited were tagged with the initials of the Dong’e Ejiao Corporation Limited, or DEEJ, the nation’s largest producer of donkey gelatin. Qin said the soaring demand for ejiao isn’t the reason that donkey populations are shrinking. Rather, fewer donkeys are being bred, he wrote, because they’ve been increasingly replaced by machines on farms. Guo Fanli, an economist in the southern city of Shenzhen, said Qin and DEEJ have inflated ejiao’s value by marketing what was typically used for what was believed to be its blood-boosting properties as something with far wider benefits to body health and beauty. “The more it has been hyped, the more miserably it could fall,” he said. “Donkey hide is just ‘boiled donkey skin,’” the commission said in a February statement on the micro-blogging site, Sina Weibo. The commission took down the post after an uproar among traditional medicine enthusiasts. One such advocate is Fu Yanlin, a professor at Beijing University of Chinese Medicine, who says he often prescribes ejiao to the 100 patients he sees a week for urinary, cardiovascular, gynecological and other ailments. The surge in ejiao demand has driven the price of donkey hides up by nearly five times — from $78 per hide in 2010 to $405 in 2015, according to the Shandong Ejiao Association. 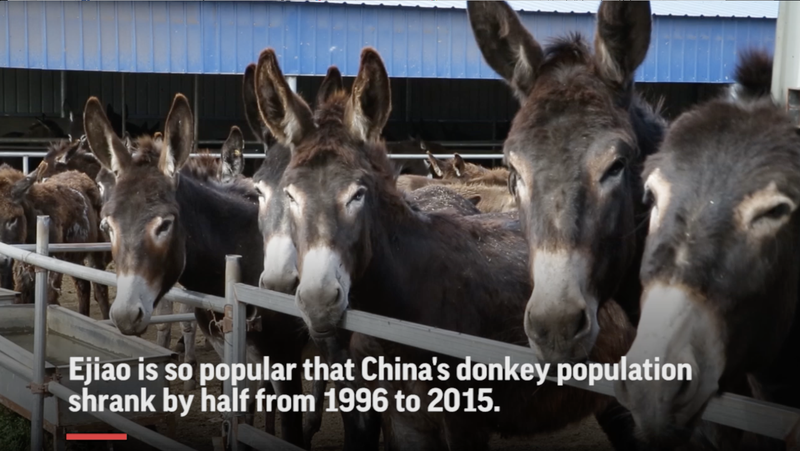 China’s donkey population, meanwhile, has halved from 9.4 million in 1996 to 5.5 million in 2015, according to Chinese state media, driving producers to look abroad. McNeil reported from Dong’e, China. Associated Press researcher Yu Bing contributed from Beijing, writer Farai Mutsaka from Seke, Zimbabwe, and video journalist Desmond Tiro from Nairobi, Kenya.